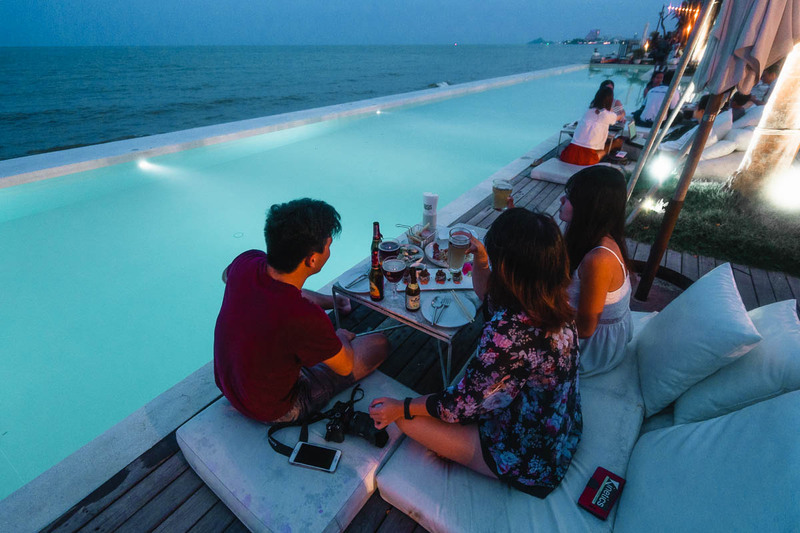 Escape Bangkok to Hua Hin for a 3D2N recharge! 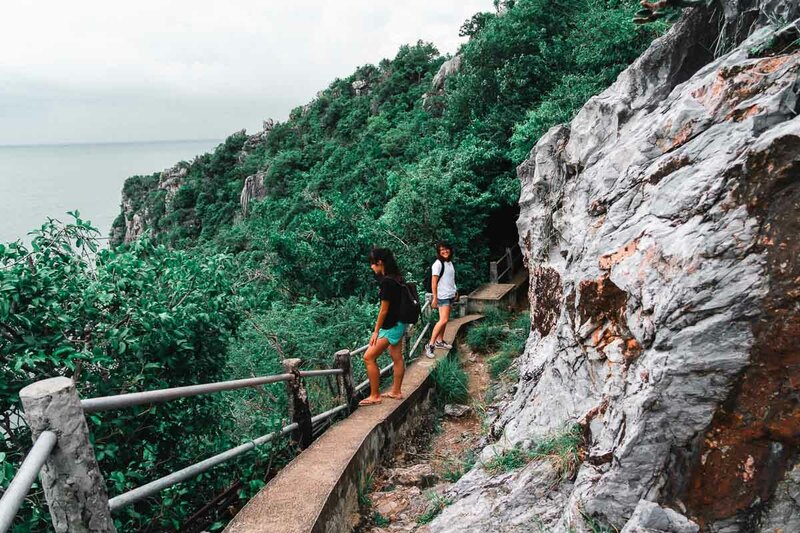 Trek to a mesmerising hidden cave, relive your childhood at a retro-styled market, or just chill at a gorgeous seaside bar. Just don’t forget the sunblock. 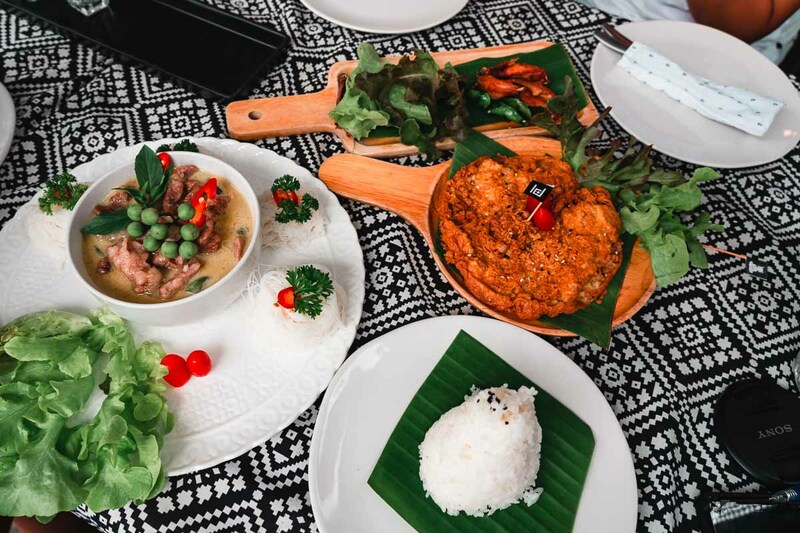 The story of Hua Hin is an interesting one — once a small and idyllic fishing village, it was transformed into a wondrous holiday destination for the Thai Royalty. 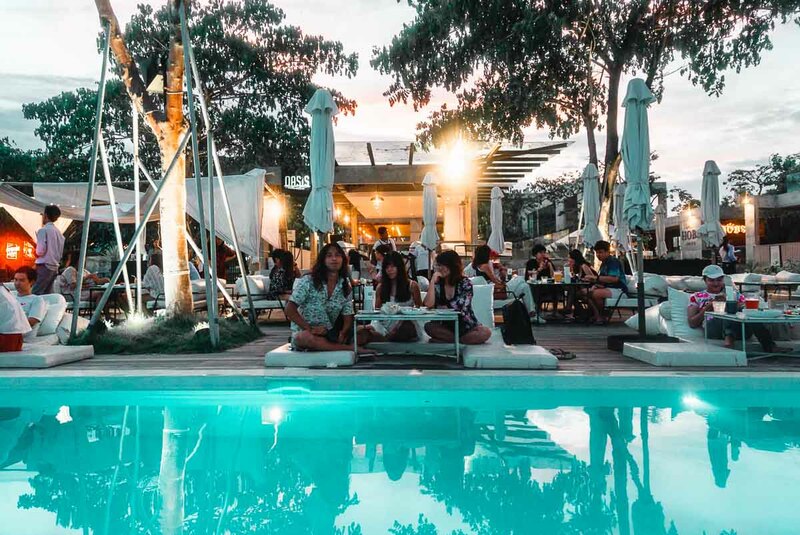 These days, it’s an up-and-coming luxurious beach getaway for both locals and travellers looking to escape the bustling Bangkok life for a little while. Here in our natural habitat by the pool. 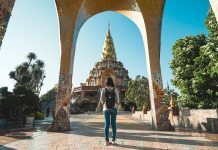 What we loved about Hua Hin was that it’s got a varied mix of conventional and unique activities. We chased the sunrise over mountains, feasted on fresh seafood, and even got to paint a street performer! 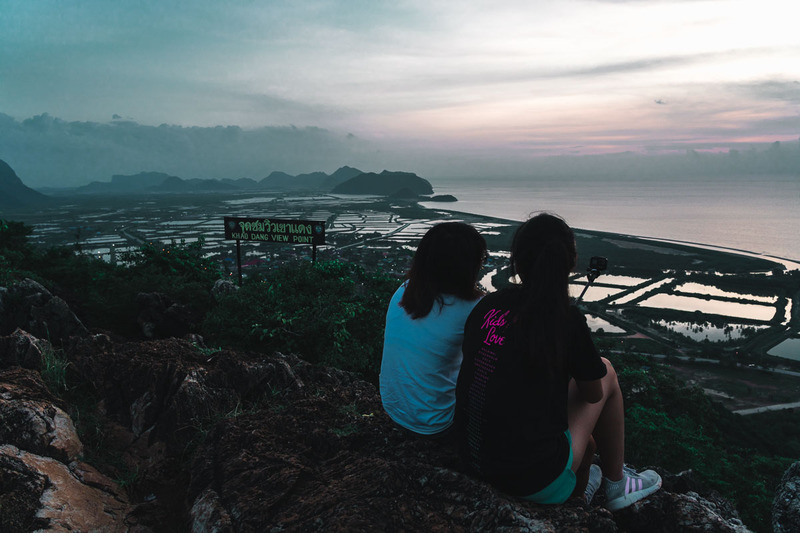 Our 3D2N Hua Hin itinerary dishes out what interesting places and experiences this coastal district offers for an epic weekend adventure. Getting Around: Public transport within Hua Hin city is quite well-connected. However, some of Hua Hin’s major attractions can be rather far (up to an hour’s drive or longer). 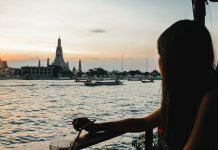 We booked a 3-day private car charter for S$452 beginning from Bangkok where we could fully customise where we wanted to go in Hua Hin. 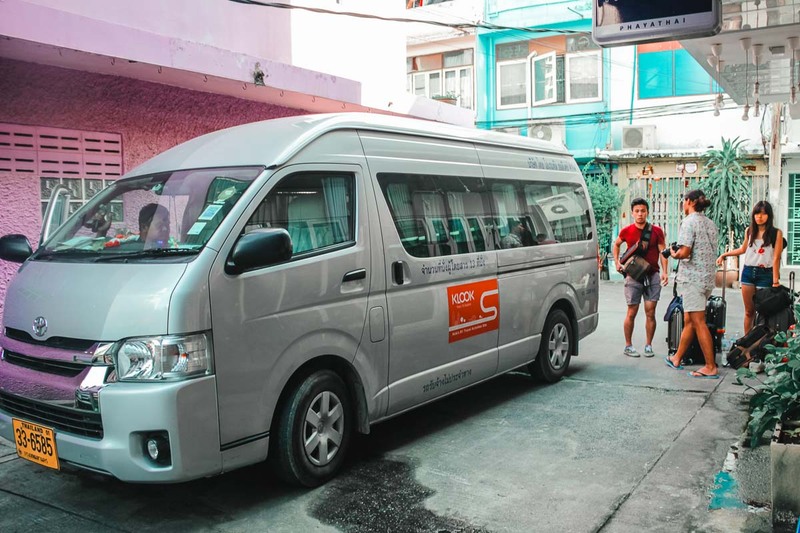 For those travelling in a group of four or more, this is also a convenient, hassle-free option to get around. Connectivity: Pre-book a 3GB local SIM card for ~S$5.50! You can add it on when booking the car charter, and the driver will pass it directly to you. First order of business — satisfy your appetite with traditional and local seafood dishes at Chainat Thai Restaurant. Price-wise, it’s steep compared to other local restaurants, but it’s worth trying for guaranteed freshness and decent portions. 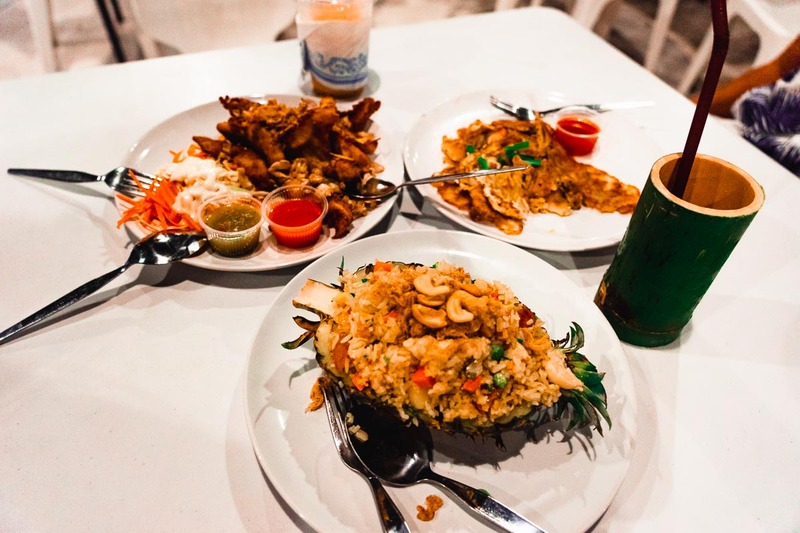 Instead of the usual Thai fare, we recommend getting the restaurant’s more interesting dishes like the deep fried horseface loach (฿120, ~S$5). It looks like a bigger version of ikan bilis (fried anchovies), but the taste was much richer and not overtly salty. If you want to fire up your taste buds, get the stir-fried crab in yellow curry and spicy tom yum kung. Both dishes cost ฿150 (~S$6.30). 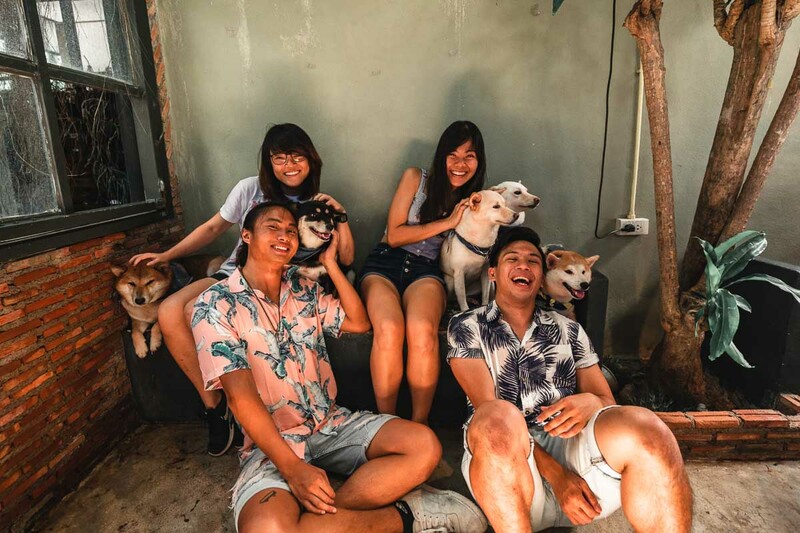 Nestled inside a private estate is Inu cafe, a homely, family-run cafe where you can play with six to seven adorable and fluffy Shiba Inus (or doges, if you prefer that term). Instead of an entrance fee, the only requirement here is to order something and you’re free to stay and play with the dogs. There also no minimum order so you can order a single dish to share. The cafe has affordably priced dishes like cheesy nachos and salted fish fried rice going for ฿89 (~S$3.70). For us, we ordered a Thai Iced Milk Tea (฿50, ~S$2.10) to cool down while chilling with the lazing dogs. Dog treats are available for ฿35 (~S$1.50). *Pro-tip: Don’t be shy to ask the friendly counter staff for a free sticker before you leave! 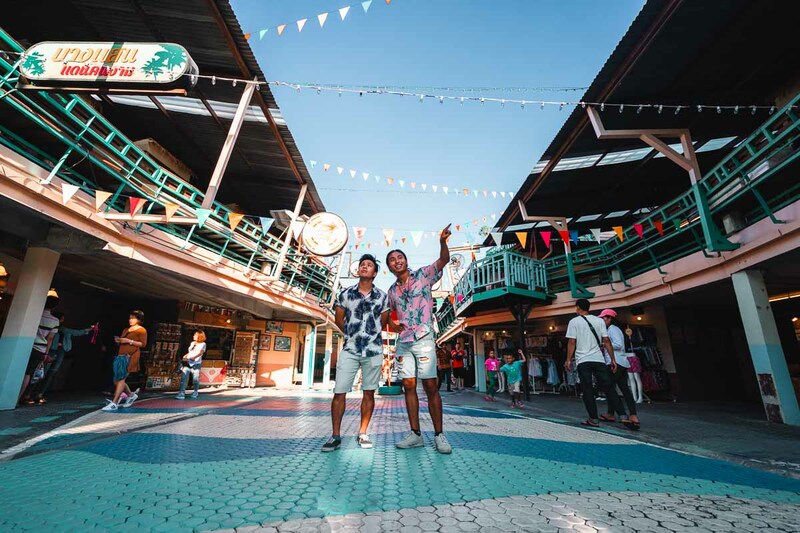 Plearnwan Market is a colourful, retro market that makes you feel like you’ve gone back in time. The shops here sell tropical-themed clothing, old-school board games and snacks that reminded us of our technology-free childhood (… man, we’re old). The best time to visit Plearnwan is in the evening — when the weather is cooler and the market lights up. If you’re feeling peckish, there’s a small food court and snack stalls on the second floor that sell a variety of treats and desserts. 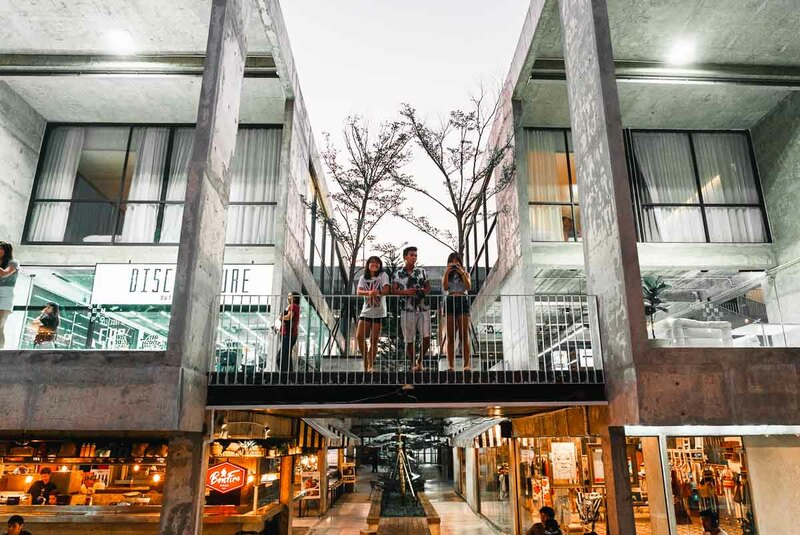 Known as Thailand’s “first ever beachfront shopping mall”, it’s easy to fall in love with the laidback atmosphere at Seenspace. The stylish mall houses cafes, hipster shops, bars, and even live jazz funk music performances. Also, almost every twist and turn in this open-air, industrial mall is rather elegant. It’s little wonder so many local and foreign tourists alike flock here for impromptu photoshoots (us included). One of the most popular places in Seenspace is Oasis, a luxurious beachfront bar that features a gorgeous infinity pool facing the ocean. 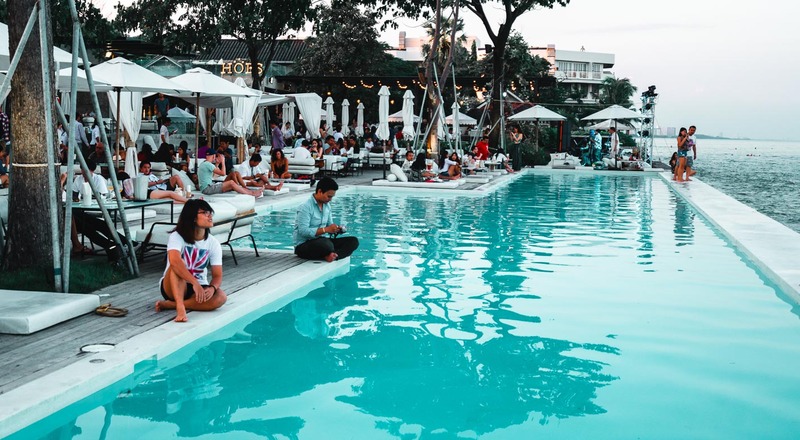 The bar is swarming with people during the sunset hour, so arrive early if you want to grab the poolside bed for the best views. From 4PM – 7PM, Oasis also offers a set menu with mains starting from ฿545 (~S$22.80) for 2 pax. 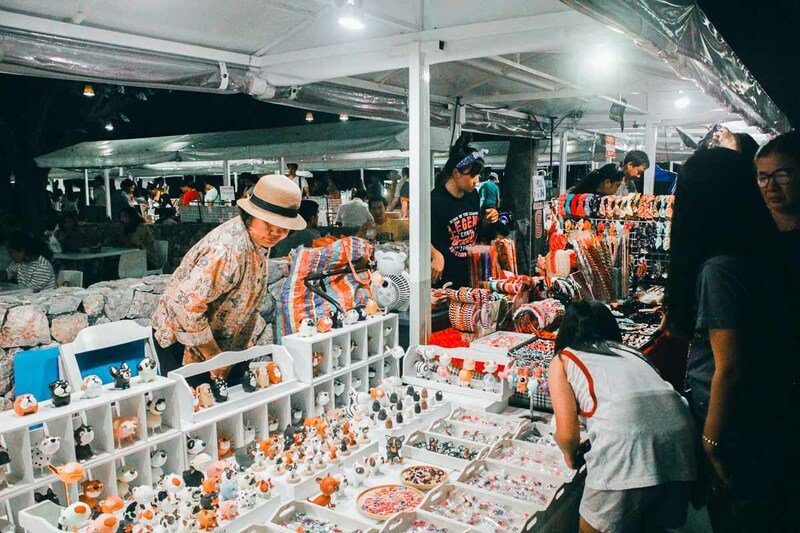 Cicada Night Market isn’t any run-of-the-mill night market you usually find when you visit Thailand. 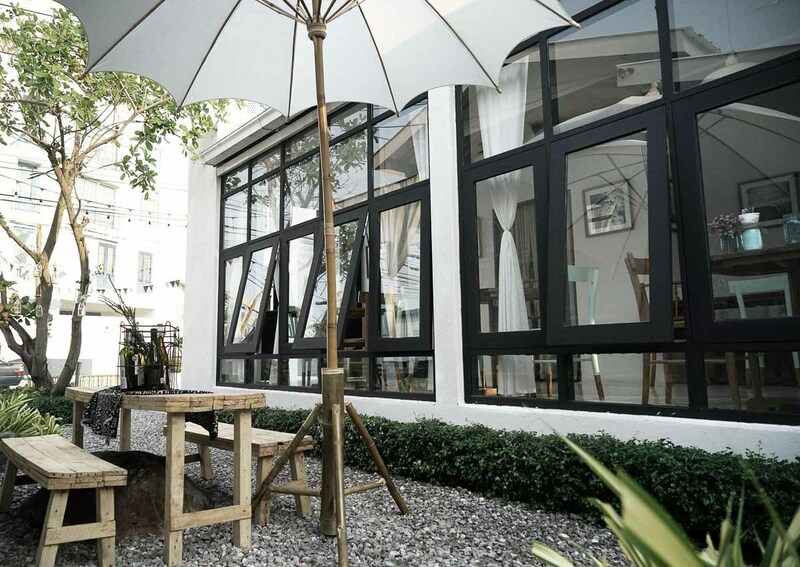 Here you’ll find locally handmade crafts like wooden-framed sunglasses, glass-blown figurines, and hand-painted porcelain dishes. Can you spot the “TTI”? The atmosphere is also buzzing with entertaining live drama performances at an open-air amphitheatre. 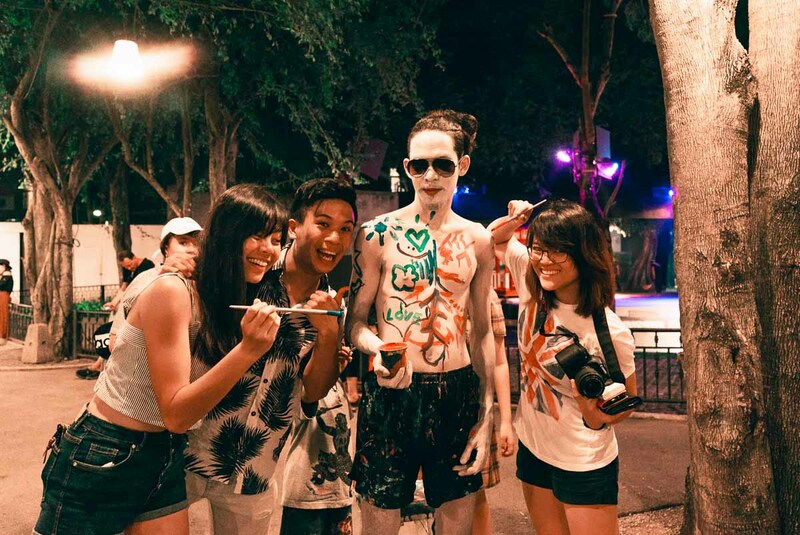 There are also interesting street side artists — like the one we encountered who allowed us to paint on him for any donated amount! Shopping aside, Cicada Night Market also has an impressive food court. 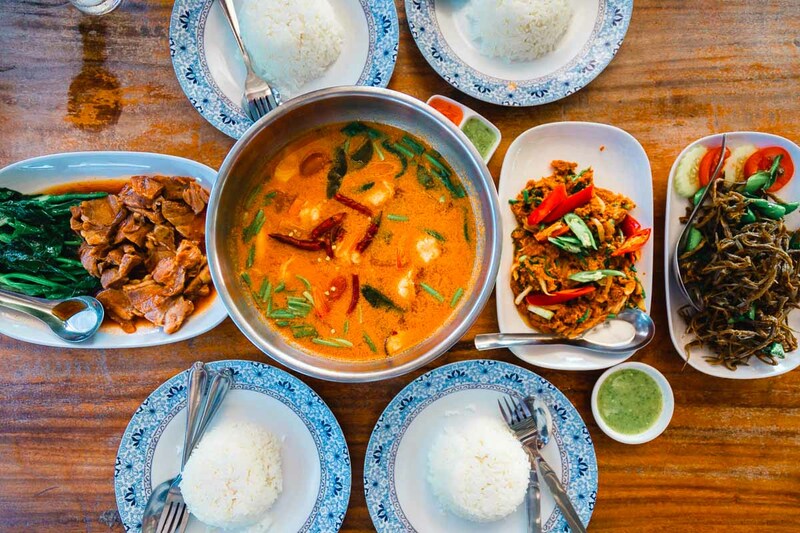 Almost every international and local cuisine is available at affordable prices, with mains ranging from ฿50 – ฿200 (~S$2.10 – ~S$8.35). You can grab small bites like Japanese takoyaki to bigger meals like pineapple fried rice or even a rack of ribs. But save your stomach for dessert! There’s coconut ice cream with free-flow toppings going for just ฿50 (~S$2.10). To purchase food, you’ll need to trade cash for coupons at the booths located at the food court’s main entrances. Any unused coupons can be refunded after. 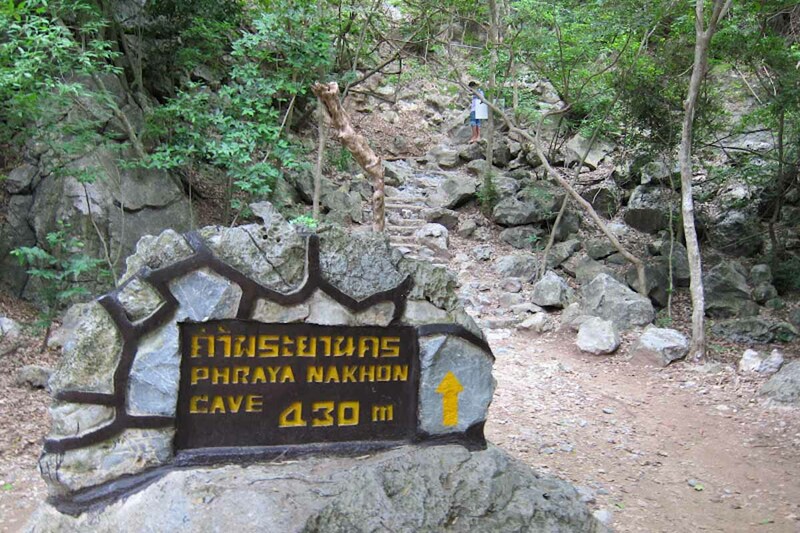 About a 90 min drive away from Hua Hin city is Khao Sam Roi Yot National Park, translated to the “mountain of 300 peaks”. 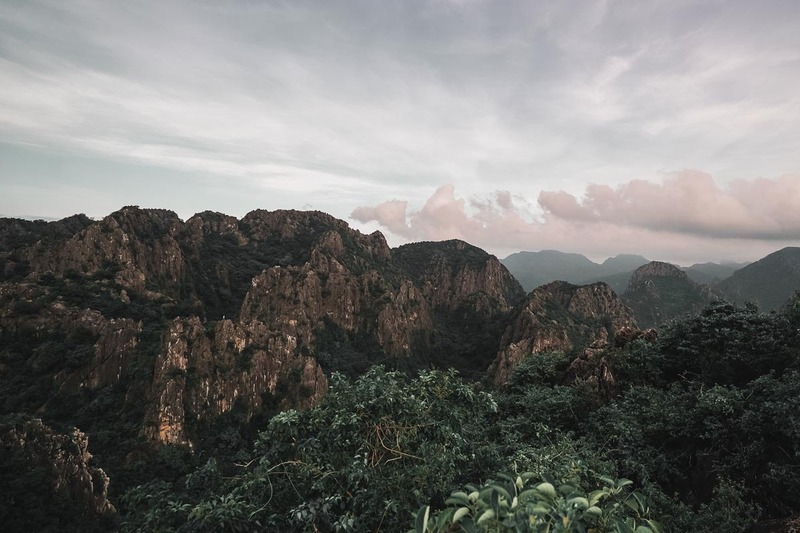 The national park is well-known for its beautiful limestone mountains, pristine beaches and hidden caves that will make any nature lover ecstatic. To enter the park, you’ll need to pay one-time entry fee of ฿200 (~S$8.40) per pax to the National Park’s headquarters before you proceed. 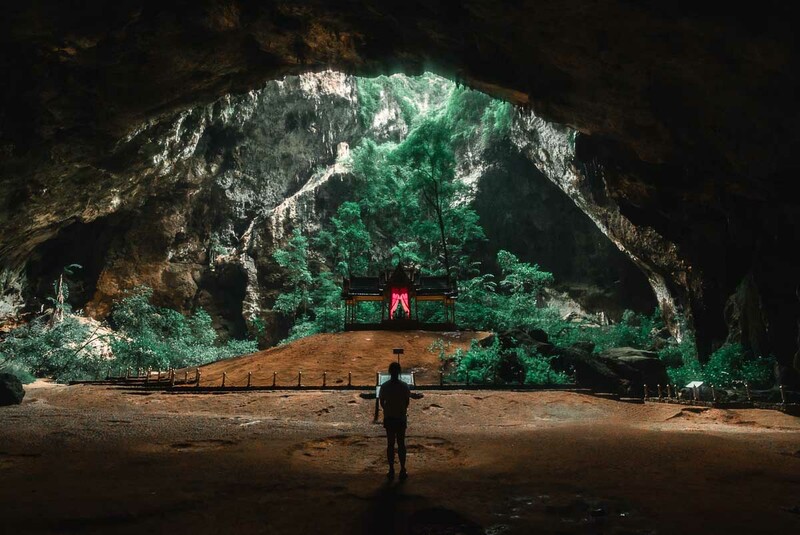 One of the main attractions of the park is the beautiful Phraya Nakhon Cave. Inside stands the majestic Khuha Kharuehat Pavilion, and is truly an enchanting sight to marvel at. The optimal time to visit the cave is around 10:30AM, when the morning light would stream in from the ceiling and bathe the pavilion’s roof in a golden glow. However, we visited on an overcast day in October and weren’t able to catch the rays. That said, we still enjoyed exploring the cave and learning more about the historical site. To get to the cave, drive 20 minutes from the national park headquarters to Bang Po beach. 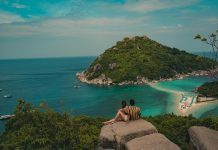 At Bang Po beach, you can either hike or take a boat to Laem Sala Beach, where the trail to the Phraya Nakhon Cave begins. The former is a short 2km hike over a small hill with many rocky steps. The walk takes about 15 minutes. Alternative, a boat ride costs ฿400 (~S$8.35) for a two-way journey. Each boat can sit six people, and takes about 10 minutes. However, the availability of the boat is dependent on the conditions of the waves and weather. 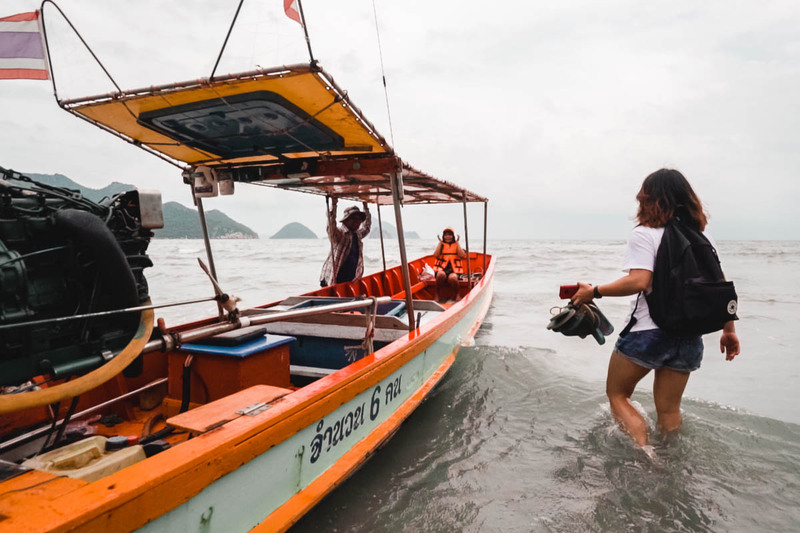 *Pro-tip: Try to gather a group of six before finding a boat to reduce possible scams, as the boat captain may try to charge ฿200 per person for the boat ride. Once you reach Laem Sala Beach, you’ll walk through a flat, shaded area before reaching the start of the nature trail. 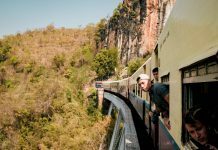 It’s a 430m-long steep and winding route that will take about 30 minutes. For this leg, I recommend wearing sturdy sport shoes as the terrain can be very muddy and slippery. The entire journey, starting from Bang Po Beach and back, will take about three to four hours depending on your fitness level. A 20-minute drive away from Bang Po Beach lies another one of the park’s more popular attractions. 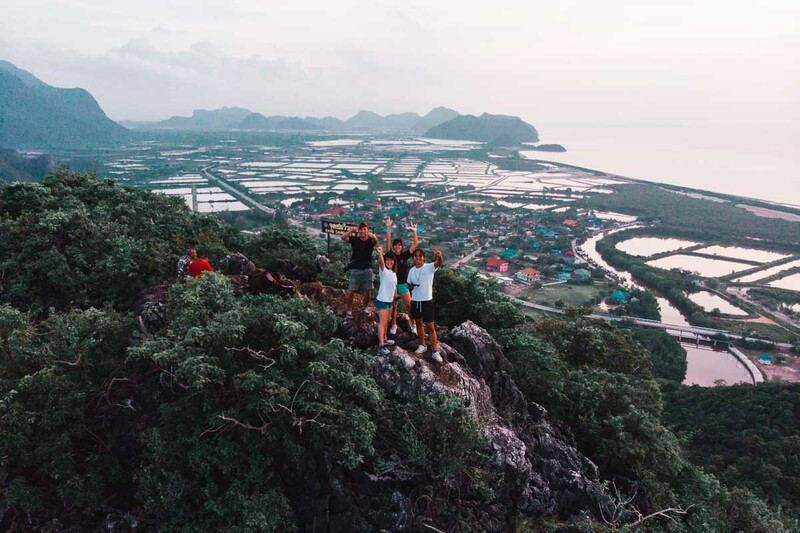 Khao Daeng Viewpoint is a 157m-tall limestone hill that holds sweeping views of the surrounding valleys, mountains, shrimp farms and ocean at its peak. It’s a steep and rocky climb all the way up, and will take about 30–40 minutes depending on your fitness level. 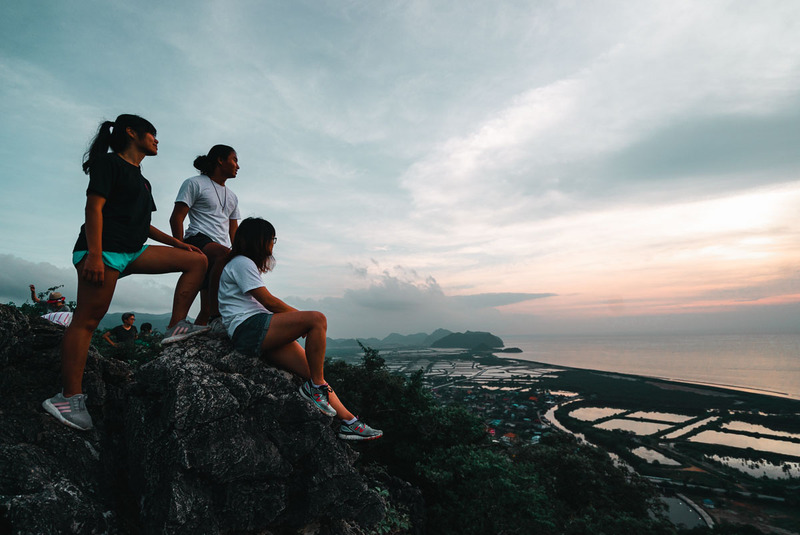 But it’s totally worth the climb — at the top, you’ll be rewarded with a cool breeze and breathtaking scenery. To add to the amazing experience, bring along some snacks so you can enjoy some food with a view. The whole journey will take about two to two-and-a-half hours. *Pro-tip: Lather on insect repellent as the trail is infested with mosquitoes. Long tights/pants would come in handy too. After roughing it out in nature, enjoy a short and scenic stroll through Thailand’s largest freshwater marsh, Thung Sam Roi Yot. 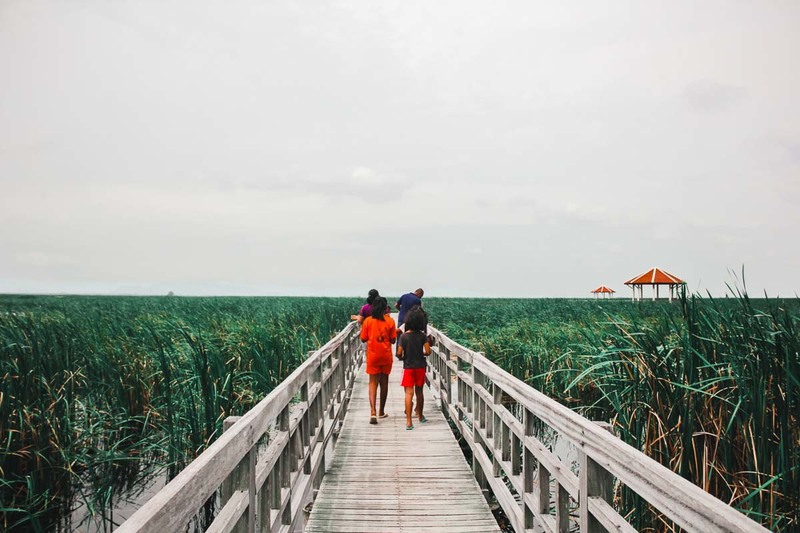 The marsh is a 35-minute drive from Khao Daeng Viewpoint, and is a wonderful place to take photos and chill out at. It’s also a popular place for bird-watching enthusiasts as many resident and migratory birds frequent the area. Do take care if you walk further down the boardwalk as the condition is dilapidated and weather-beaten. Some wooden planks are dislodged, and have not been repaired yet. After a long day in nature, leave the national park and drive for an hour to the 1d+ Day Artist Cafe. 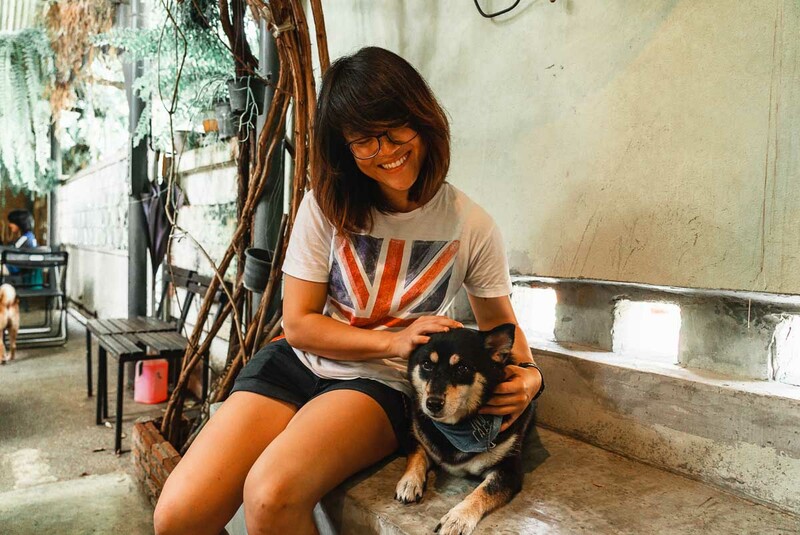 It’s a popular cafe among locals and tourists who come dressed in their finest for brunch and an Instagram photoshoot. While the cafe is charming, the food and drinks here are on the pricier side. We avoided the usual cafe dishes and opted for the cheapest eats on the menu. But cheap isn’t bad — we were blown away by their minced pork omelette (฿65, ~S$2.70). It was so fresh, crispy and delicious we instantly ordered another one. 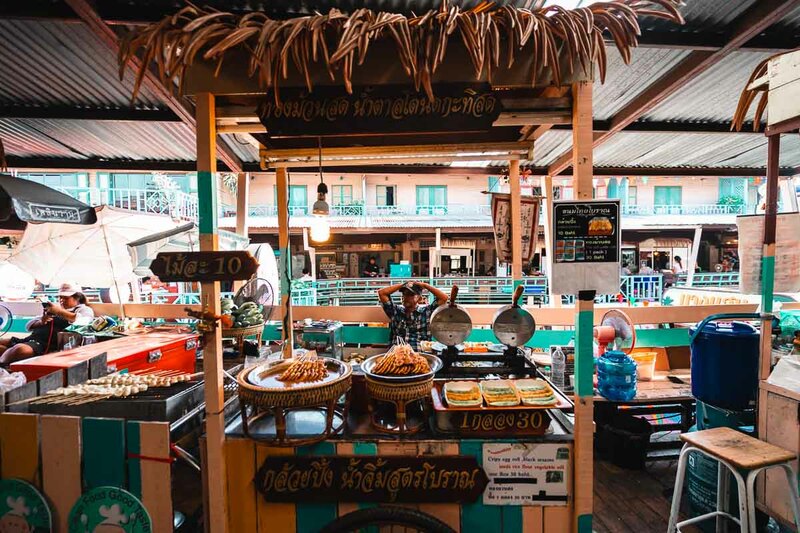 After a hearty meal, head back to your accommodation to freshen up before exploring the Hua Hin Night Market. At first glance, it doesn’t look any different to other ubiquitous night markets. 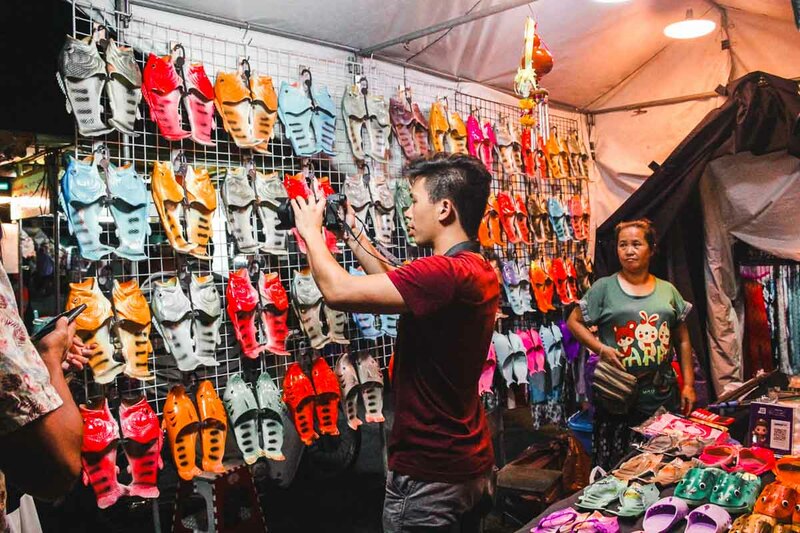 You’ll come across vendors selling the usual wares like bracelets, elephant pants, tropical fruit, and odd-shaped slippers. Still, it’s a fun place to walk through and window-shop. But further down the street, you’ll spot many restaurants selling a plethora of seafood. From salt-crusted fish to grilled prawns and even cheese lobsters, it’s too easy to splurge and overeat. 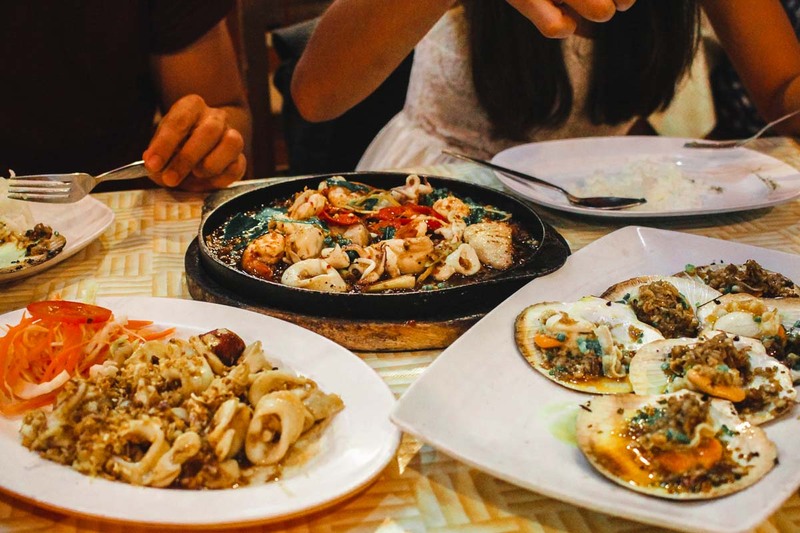 We dined at Rod Fai Seafood, and loved their succulent black pepper and garlic scallops (฿120, ~S$5). If you’ve got a strong stomach, get the spicy mixed seafood hotplate (฿300, ~S$12.50) and enjoy the slow burn. 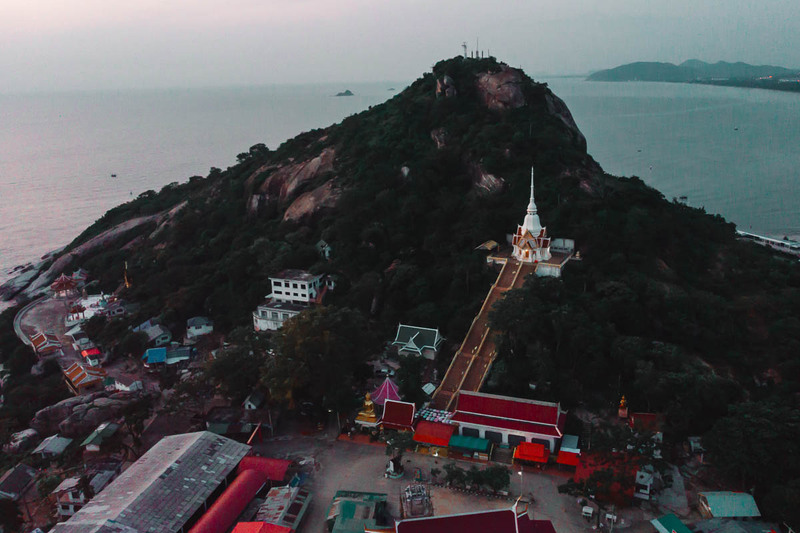 Located at the top of Khao Takiap (also known as Chopstick Hill) is a small Buddhist temple that offers scenic views of the Gulf of Thailand. Along the perimeter of the temple, there is a long row of metal bells where you can use a coin to ring them before donating it for good luck. 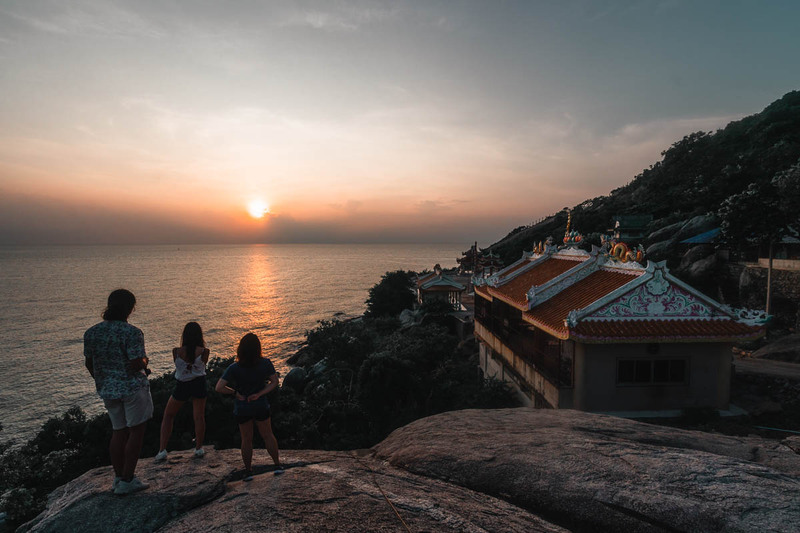 Wat Khao Takiap is also an great place to catch the sunrise over Hua Hin, especially if you want to end off your trip with an epic bang. Except it wouldn’t fully be in peace. You’ll be sharing the views with a hoard of mischievous macaque monkeys who inhabit the area. While they’re not aggressive, they certainly will try to steal anything they think is food so keep your belongings secured. *Pro-tip: Instead of going straight up the stairs to the temple, get the best sunrise views by turning left and walking down a steep road for about 100m. You’ll come across a large rock on your left, which faces the direction of the sunrise. 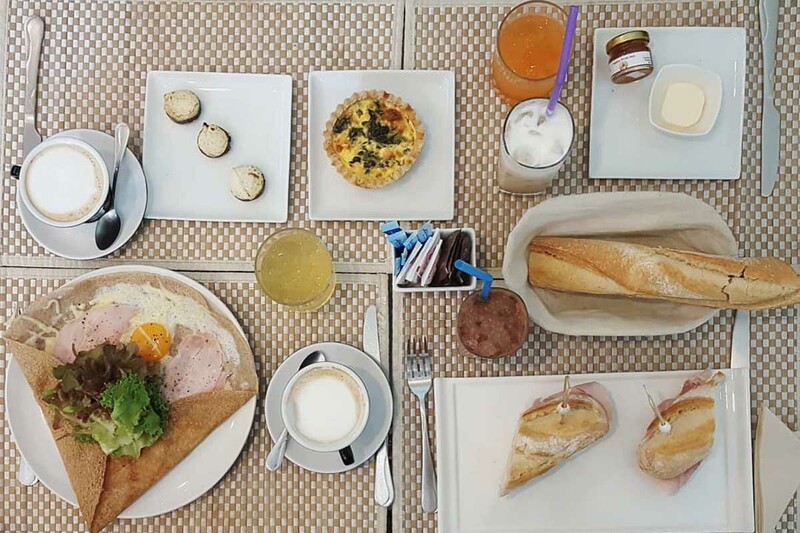 A small and cosy French delicatessen hidden away from the main street, Mirabelle is a popular eatery in Hua Hin where you can enjoy a medley of freshly baked croissants, baguettes and quiches for breakfast. The charming cafe also serves a wide collection of delicious beverages and homemade jams you can bring home. One of their must-try specialties is the French gallette — a traditional buckwheat pancake that’s stuffed with ham and cheese (฿175, ~S$7.30). 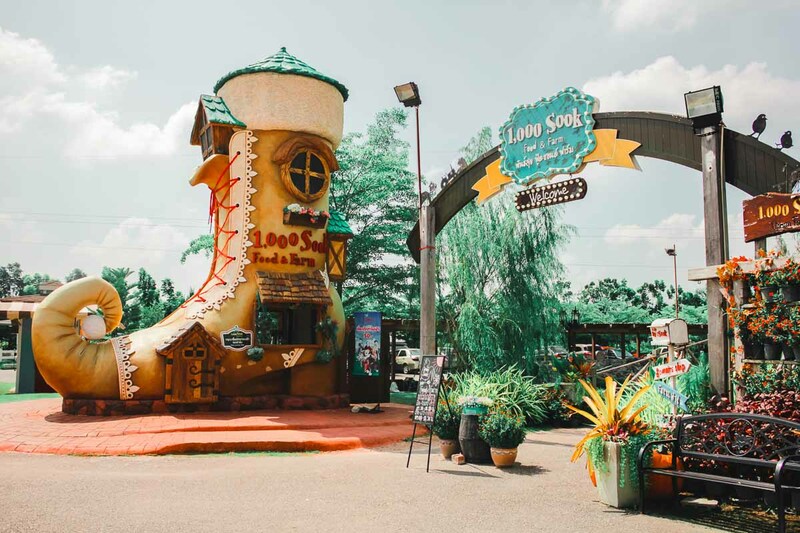 As you depart Hua Hin for Bangkok, make a pit-stop at the 1000 Sook Food and Farm. 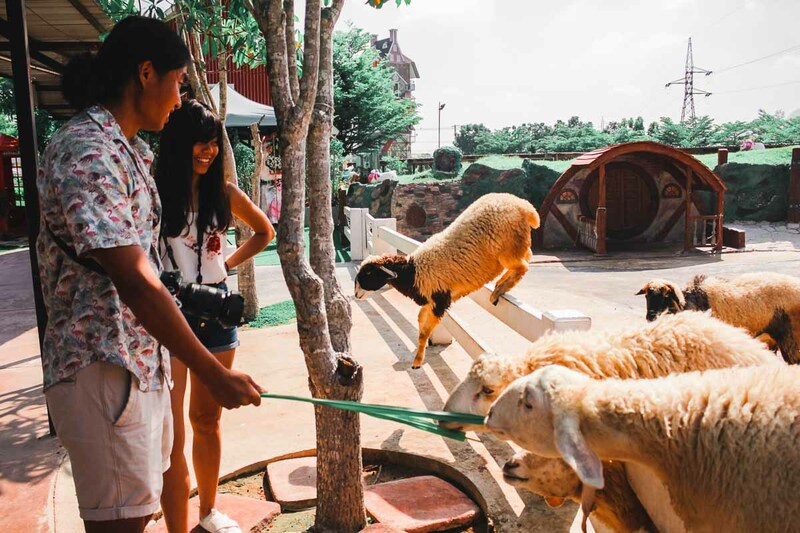 The whimsical American country-styled farm has colourful barns that house animals like Shetland ponies and rabbits you can interact with. We caught a sheep making a great escape. The entrance fee includes a complimentary ticket to feed the sheep. If you’re (un)lucky, you might encounter a naughty one that will jump over the fence and approach you directly for food! 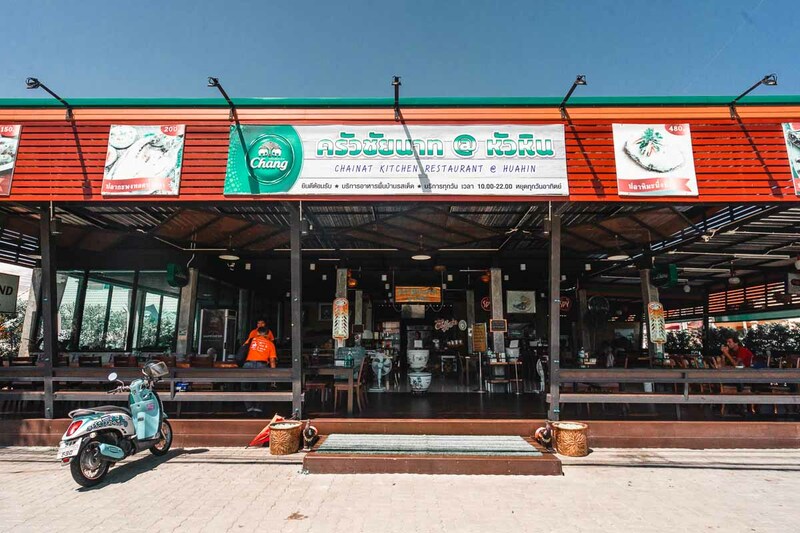 *Pro-tip: Before entering the farm, have a meal at the 1000 Sook Steak & Restaurant which serves Thai and Western Cuisine. 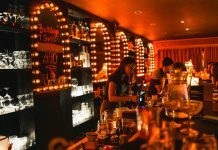 You’ll score one free entry for every ฿200 (~S$8.35) spent. 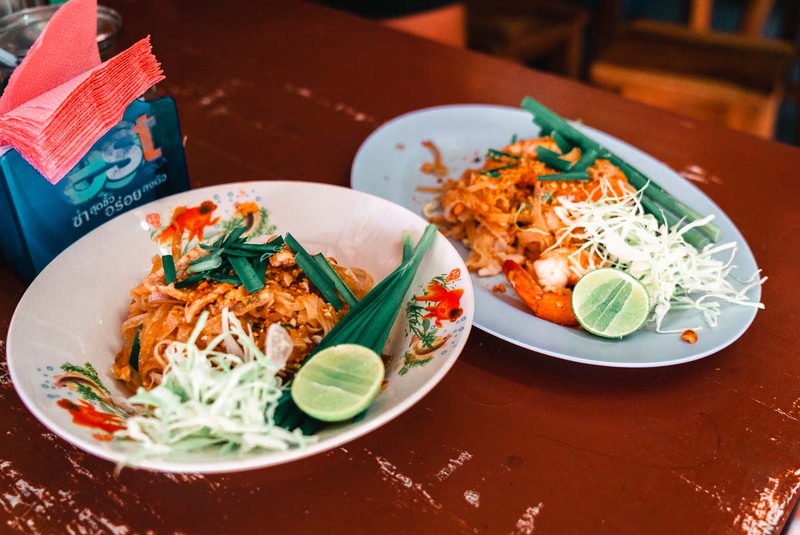 Tha Yang Pad Thai (ร้านผัดไทยท่ายาง) is a no-frills eatery that sells pad thai using a 100-year-old recipe passed down from three generations. The shop’s two signature dishes are the pork pad thai (฿35, ~S$1.50) and prawn pad thai (฿55, ~S$2.30). While the portions were small, we were amazed by the lightness and unique flavour of the dishes. The springy noodles were infused with the sweetness of tamarind, which cut through the saltiness of the fish sauce. The bean sprouts were fresh and crunchy, and the proteins were abundant. The shop may be a little out of the way, but is definitely worth the detour. 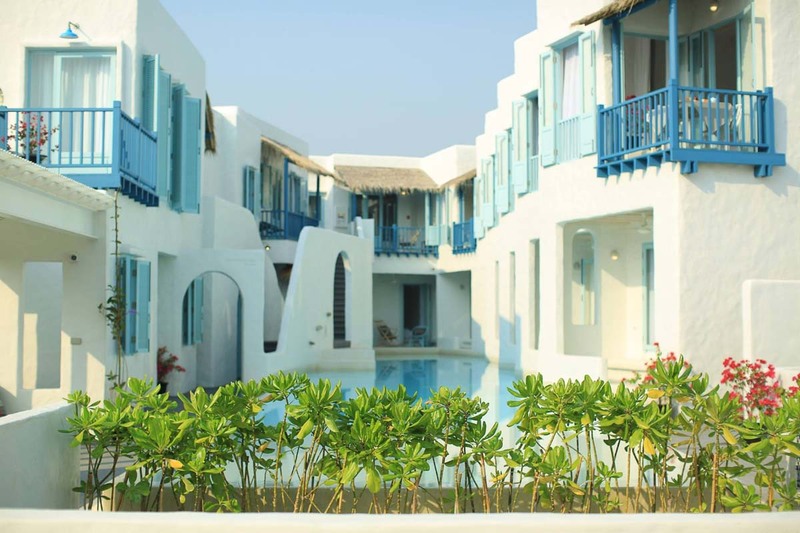 Resort de Paskani — Resort located 5.5km from the city from S$100/night. 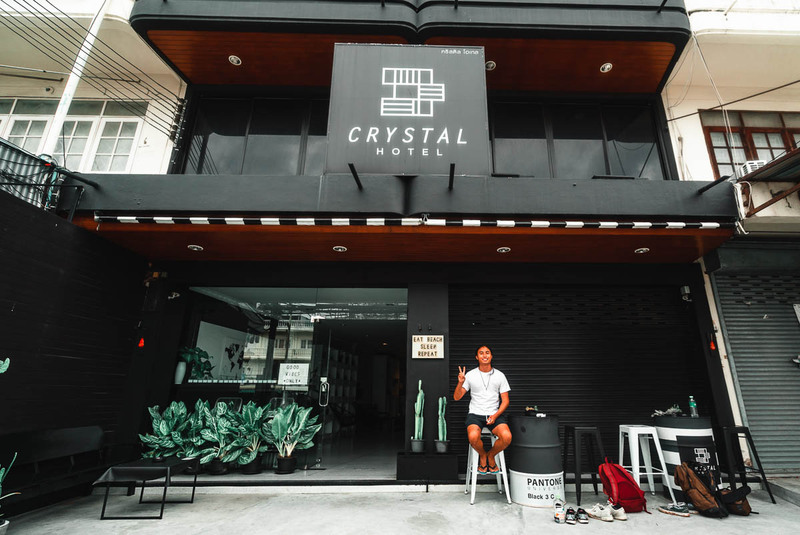 Crystal Hotel — Budget hotel located 850m from the city from S$30/night. 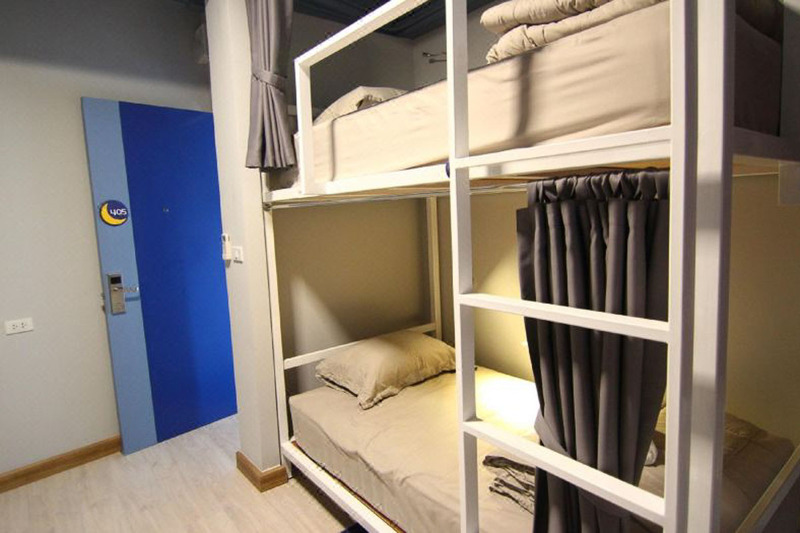 Moon Hostel — Budget hotel located within the city from S$16.50/night. A refreshing breath of air just three hours away from Bangkok, Hua Hin is teeming with natural beauties and interesting attractions that will appeal to those looking for a new adventure and/or a unique place to chill. The unfortunate drawback is that some of these places are littered all over the district and are not easily accessible via public transport. Leaving our shoes in the van meant lesser weight in our bags! Experience Hua Hin’s gems to the fullest by booking a custom Hua Hin tour from Bangkok. What you’ll need is a planned 12-hour itinerary with about four or five attractions you’d like to see (or you can follow ours above ). When booking, ensure you have your itinerary ready as you’ll need to enter these details during checkout. This is to help the driver plan the most efficient route, and will help you gauge how long you can spend at each attraction. If you’re travelling in a group larger than three people, there’s an option for a spacious van that can seat up to 10 people. 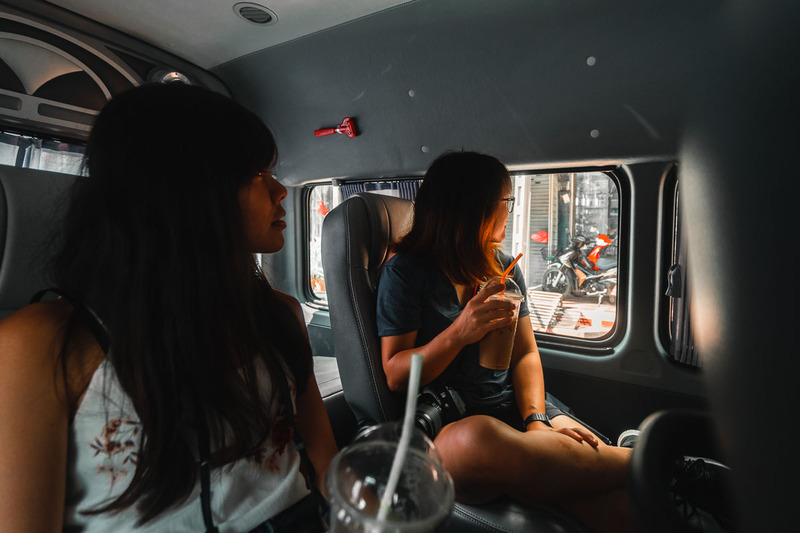 Having our own private van also meant we didn’t need to worry about how to get to Hua Hin from Bangkok, or fret about our belongings if we took public transport. At the end of our trip, it’s easy to see why Hua Hin is loved by the Thai royalty. The magnificent natural beauties, breezy white-sanded beaches, and city with an easy-going vibe made our holiday an eventful yet relaxing one. We were honestly sad to leave Hua Hin, but we know we’d definitely come back again in time. Have you been to Hua Hin? Let us know what other amazing places we should visit in the comments!